I'm attempting to put together a Crimean War Russian uniform. I've been looking into this for a couple of years and have now got a few sources of info and some ideas for basic kit to start with. If anyone has any interest I'd appreciate any advice or just someone to sound out ideas with. Here are links I've found from the Russian Internet. I hope they 'll help though there's all in Russian there. А page from a Russian forum where questions of Krimean War reenactment are discussed. A book about Krimean war by a participant, with drawings. Hi Nick, I'm in Hampshire. So far there is myself and one other but I have a discussion group on Living History Worldwide that has about 9 people. We're not thinking of doing cossacks just ordinary army or naval infantry, but anyone with an interest is welcome so if you want to join us as a cossack that would be great. Velund wrote: Here are links I've found from the Russian Internet. I hope they 'll help though there's all in Russian there. Thanks for posting those links, some I've seen before but there is some new interesting stuff there too. Hope it takes off..give me something to charge at!!! Moment In Time has Russian impressions from the 19th/20th century s and new for this year Polish impressions covering from the 17th thru to 19th century. Did you ever have any luck getting a Russian impression together? It is something we have been mulling over for some time- the problem is getting suitable guns- I believe that springfields bear a reasonable resemblance to the Russian muskets. czartank wrote: It is something we have been mulling over for some time- the problem is getting suitable guns- I believe that springfields bear a reasonable resemblance to the Russian muskets. I've been thinking about doing Crimean French, and have had similar difficulties. Other than buying antiques (expensive and irregular supply) my only other thought was to get Indian Charleville muskets converted to percussion. These would not be perfect, but wouldn't look too far from the correct gun. I thought of converted Charlevilles too as this is exactly what a lot of Russian regiments were equipped with. All Russian muskets and rifled muskets were copies of their French equivalents, with the locks positioned to the rear of the trigger so a Springfield would not look right. They usually had mostly brass fittings too. Another option is the Brunswick rifle that Derbyshire arms sell as this is a close match to the Luttich carbine used by Russian rifle units. 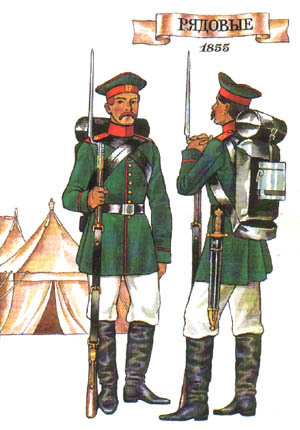 Also reading some Russian viewpoints of the war there were whole units in Sebastopol equipped with captured French rifled muskets and British enfields (plenty of these around) because they were much better quality than Russian weapons. Stealing allied rifles was the prime objective of Russian trench raids.